Originally the best girlfriend ever suggested to head for Arlesford (Essex village of the year) for the traditional weekend trip north, but the weather turned nasty just minutes after we were on our way, so we ended up much closer to home in a small Essex coastal town famous for its salt. Maldon has everything she craves for on a Saturday afternoon: a bit of shopping in the organic shop, a cutesy flower shop, an unbelievable venue that sells everything apart from pinking shears and for communal elation one of the best pubs in Essex, the Blue Boar. So while her highness was busy exploring the floral improvements that our house could incorporate, I spotted a basket full of vinyl in one of the charity shop. 5 minute later I walked out, elated. 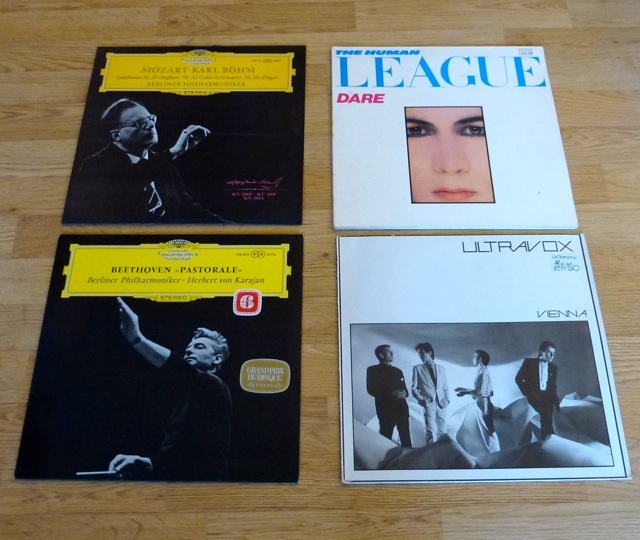 Not only did I get two of the best electronica albums of the eighties, I also purchased two excellently preserved ‘Deutsche Grammophon’ LPs with recordings by Karajan and Boehm. Price? 2 pounds for the four of them. As soon as I got home I gave them a spin on my Ortofon studded Pro-Ject and wasn’t disappointed: these bargains sounded magnificent, with the 2 classical recordings specifically giving the Klipsch Horns loads of dynamic to work with. 2 Hours of music for 2 pounds. I have to accompany the best girlfriend ever more to her little shopping trips. ← New Soul that you can listen to without wanting to strangle a chicken.